My name is Henry. I’m a large blonde male greyhound that’s a little timid on first meeting but, once I’ve ‘sniffed’ you out, then we can shake paws and be best buds. I’m an easy-going fella and enjoy hands-on affection. 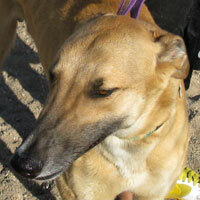 I’m a good-looking hound but could use a day at a doggie spa – my coat is a gorgeous color so I know I’ll clean up well. However, my smile is picture perfect. My chompers are so clean that when I smile at you on our early morning walks, sunlight will bounce right off my teeth, so you’ll need to wear shades to protect your eyes HA! I like my raised doggie bed but I look forward to a large, sumptuous doggie bed all my own that cuddles every curve of my body as I dream the night away. I’m not really picky about color, but if you could find one in turquoise or teal, that would be excellent.